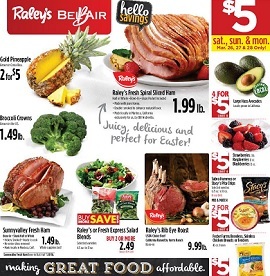 Raley’s Weekly Ad Specials, valid April 17 – April 23, 2019. This Week Ad best deals, and grocery savings on: Clif Builders Bar Box S’mores; Crown Royal Regal Apple; Natural Gourmet Strawberries, Pre-packed; Tender Green Asparagus; Raley’s Black Angus Beef Tri Tip Whole Roast Trimmed – USDA Choice; Earthbound Farm Baby Spinach; Frito Lay Colossal Pack, Variety Pack; Pork Loin Backribs; Tomatoes On The Vine; Foster Farms Chicken Breast, Boneless Skinless; Raley’s Chicken Thighs; Foster Farms Thin-sliced Chicken Breast Fillets; Pork Tenderloin, Grain Fed; Oroweat English Muffins, 100% Whole Wheat; Black Angus Beef Sutter Sirloin Steak; Sensodyne Toothpaste, Anti-cavity Fluoride, For Sensitive Teeth, Gentle Whitening, Alpine Breeze; Simply Orange Orange Juice; and more. Find all deals, offers, and prices in the latest Raley’s Weekly Sale Ad Circular.